This is an entry for Spittoon Extra's event "Waiter, there's something in my...", the currant theme is of course sauces and this fits the bill perfectly. See, in the summer I almost always go for cold sauces. I have no inclination of standing at the stove more than I need to, so it's much more often a cold sauce, and something coooked on the barbecue. Rocket, or arugula, is one of my favorite types of greens. It's rather strong and has a mustardy tone, and it's great for a simple salad. It's also great for making a cold sauce, as we discovered the other night. We had to improvise and had "nothing" in the fridge. However, I managed to scrape this together, and boy, am I glad I did! It's super tasty and easy to make - and I've made it twice since, already. Chop the rocket coarsely. 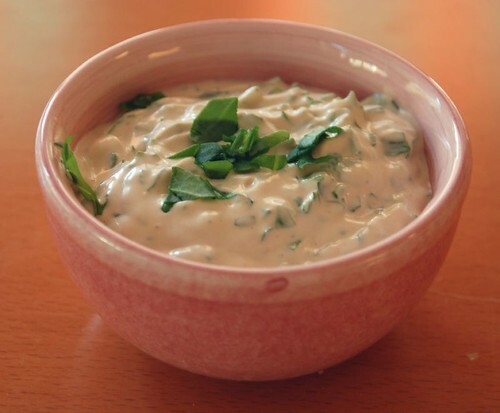 Mix yogurt and mayo, and flavor with chipotle and cayenne, and a dollop of honey if it's too sour. You can add a little salt, too. Mix in the rocket, and serve. You can prepare it several hours in advance - it keeps well in the fridge. Add some garlic for more of a bite, if you'd like. I think jeanne is right! A great entry; thanks for taking part in Waiter. Next theme should be announced shortly on Cooksister. Hope you can join in again.